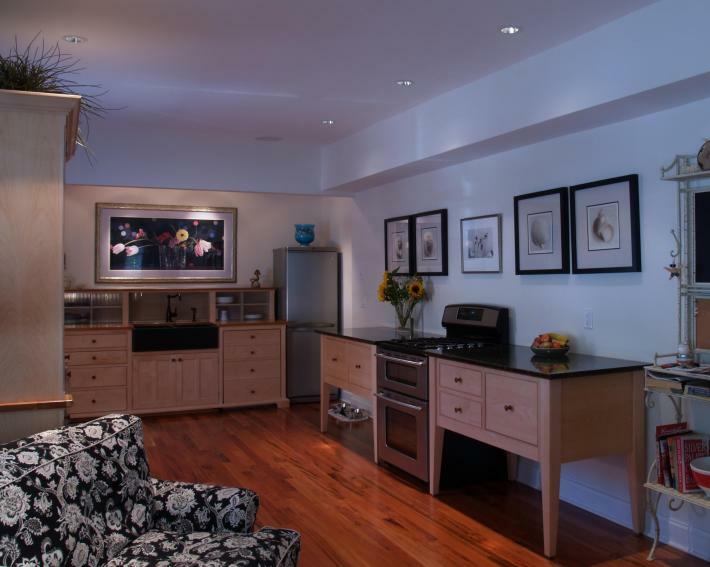 This Vacation Home kitchen in an old New Jersey beach community features an unfitted collection of four kitchen workstations including a Working Pantry, a Sink Workstation and (2) Work Tables.The sculptural and symmetrical freestanding maple workstations blend with the hi-tech appliances to form two separate but symmetrical work areas, each focused around the sink or range. This symmetry, coupled with the lack of upper cabinets gives this kitchen its simple, comfortable feel because symmetry is so easy for the eye to understand (compared to the often chaotic assemblage of continuous cabinetry, counter tops and appliances). 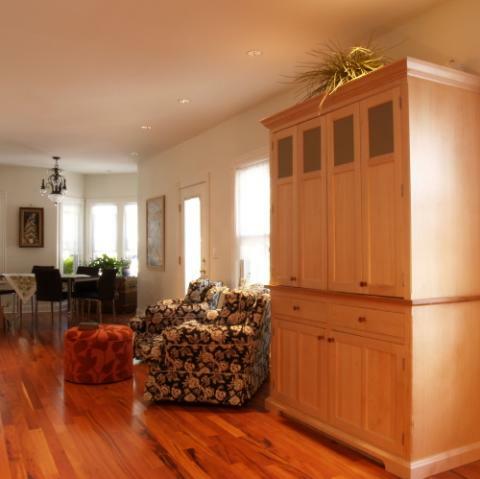 The continuity of seeing the tiger-wood floors and light colored walls between all the unfitted furniture pieces also allows the adjacent living and dining areas to blend flawlessly into the kitchen. The owners chose to hide only the dishwasher, and expose the stainless steel refrigerator, freezer and range in two separate symmetrical arrangements. 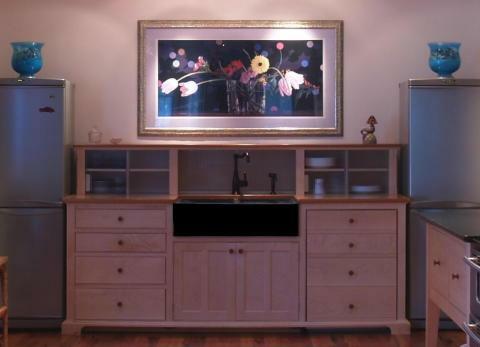 The storage capacity of the freestanding Working Pantry eliminates the need for continuous bands of upper cabinets and allows those areas above the counters to be used to display art work. There is room between the individual pieces for the dog’s water bowls and an original window that could not be blocked by standard cabinetry. Please click on the following link for more information about this unfitted kitchen at the beach.